Using the concept of the delta wing interceptor seen on the Dassault Mirage III, Dassault built a new fighter jet design. This configuration is not ideal with regard to maneuverability, low-altitude flight, and distance required for take-off and landing, but has advantages in high-speed flight characteristics, simplicity of construction, low radar signature and internal volume. * Parachute brake is on the tail, just above the engine exhaust. * The aircraft's neutral point was moved in front of its center of gravity, giving the fighter a degree of instability that enhances maneuverability. * A runway arresting hook or fairing for a brake parachute can be fitted under the tail. The landing roll was reduced by robust carbon brakes. The backward-retracting, steerable nose gear features dual wheels, while the main gear features single wheels and retracts inward into the wings. * An airbrake is fitted on top and below each wing in an arrangement very similar to that of the Mirage III. A noticeably taller tailfin allows the pilot to retain control at higher angles of attack, assisted by small strakes mounted along each air intake. * First fighter jet with negative static stability. Multi-spar metal wing; elevons have carbon-fiber skins with AG5 light alloy honeycomb cores; carbon-fiber/light alloy honeycomb panel covers avionics bay; most of the tailfin and all of the rudder are skinned with boron/epoxy/carbon; the rudder has a light alloy honeycomb core. The aircraft has a redundant fly-by-wire automatic flight control system, providing a high degree of agility and easier handling, together with stability and precise control in all situations. Fighter's Airframe is naturally unstable, and so it is coupled with FBW commands to obtain the best agility; however, in override mode it is still possible to exceed a 270 deg/sec roll rate and allows the aircraft to reach 11 g (within the 12 g structural limit), instead of nine when engaged. The system is reliable with no known losses due to its failure. The aircraft uses a retractable tricycle type landing gear by Messier-Bugatti, with twin nosewheels and a single wheel on each main gear. Hydraulic retraction, nosewheels rearward, main units inward. Oleo-pneumatic shock absorbers. Electrohydraulic nosewheel steering ( /-45 degrees). Manual disconnect permits the nosewheel unit to caster through 360 degrees for ground towing. The fighter is available as a single-seat or two-seat multi-role fighter. The pilot flies the aircraft by means of a centre stick and left hand throttles, with both incorporating hands-on-throttle-and-stick (HOTAS) controls. The pilot sits on a SEMB Mark 10 zero-zero ejection seat (a license-built version of the British Martin-Baker Mark 10). Unlike in the F-16, the pilot sits in a conventional position, without the steep backward slope of the F-16 seat. The cockpit is quite small, and there is no bubble canopy. Despite this, the cockpit visibility is quite good, but less than the F-16, especially at 'six O'clock' (rearwards-looking) position. The instrument panel (in the Mirage 2000 C) is dominated by a Heads Up Display (HUD) with the VMC 180 radar screen located centrally below it. To the lower left is a stores management panel, above which are the navigation instruments and altimeter. The right half of the instrument panel accommodates the engine and systems displays. Located on the left side of the cockpit, just ahead of the throttle, are controls for the communications equipment, including the Have Quick secure radio. * Sagem ULISS 52 inertial navigation system (INS), TRT radio altimeter. * Sextant TMV-980 data display system (VE-130 head-up and VMC-180 head-down) (two head-down in 2000N/D). The combined head-up/head-level display is collimated at infinity, and presents data relating to flight control, navigation, target engagement and weapon firing. Sensor and system management data is presented on two colored lateral displays. * Dassault Electronique Type 2084 central digital computer, Digibus digital databus (2084 XR in 2000D) and Sextant Avionique Type 90 air data computer. * LMT NRAI-7A IFF transponder, IO-300-A marker beacon receiver, TRT ERA 7000 V/UHF com transceiver, TRT ERA 7200 UHF or EAS secure voice communications. * Thomson-CSF RDM multi-mode radar or Dassault Electronique/Thomson-CSF RDI pulse-Doppler radar for the Mirage 2000C/D, each with an operating range of 54 nm (100 km / 62 miles). This unit was an evolution of Cyrano radars, with more modern processing units and look-down/shoot-down capabilities. The effective range is around 60-70 km with modest capabilities against low-level targets. It is linked with Super R.530F missiles, and equipped the first 37 aircraft delivered to the French Air Force (Armée de l'Air) and most exported Mirages. It has multirole capabilities that enable its use in air-to-surface tasks, including anti-ship roles. The very early RDM were still not linked with the Super R.530F missiles, but it was solved quickly. * RDI interception radar. A specialized radar for air-to-air tasks delivered mainly with the Mirage 2000C for the Armée de l'Air. It has a much improved range of about 150 km, and is linked to Super R.530D missiles; much improved compared to the "F". Look-down/shoot-down capabilities are much improved as well, but this radar is not usually used for air-to-surface roles. * Dassault/Thales Antelope 5 Radar with terrain avoidance capability for Mirage 2000N Nuclear Strike variant. * The Thales multimode RDY (Radar Doppler Multitarget) developed for the Mirage 2000-5. Third generation radar, with multiple target capabilities (comparable to the AWG-9) and MICA missiles. This radar equipped many of the most recently exported M.2000s, as-well as the first Mirage 2000RDM updated to 2000-5 standard. * Thales Serval Radar warning receiver (RWR) with antennas on the wingtips and on the rear of the top of the tailfin. * Dassault Sabre RF jammer in a pod below the bottom of the tailfin, with an antenna in a fairing on the front of the tailfin. * Dassault Éclair dispenser system under the tail. This was eventually replaced by a pair of Matra Spirale dispensers, one fitted on an extension behind the rear of each wingroot, giving a total capacity of 224 cartridges. The Mirage 2000 is equipped with a SNECMA M53-5 (first 37 airplanes), or SNECMA M53-P2 low-bypass ratio turbofan engine, depending on the aircraft version, which provides 64 kN of thrust dry and 98 kN in afterburner. The air intakes are fitted with an adjustable half-cone-shaped centerbody, which provides an inclined shock of air pressure for highly efficient air intake. 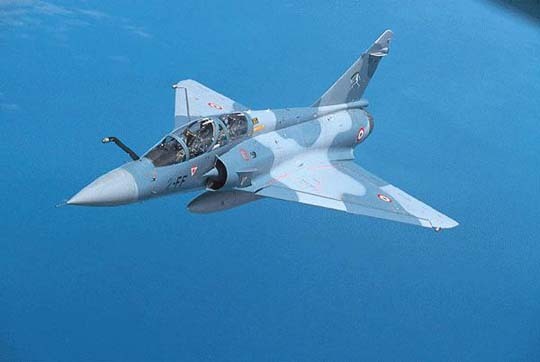 Total internal fuel capacity is 3,978 litres in the Mirage 2000C and E, and 3,904 litres in the Mirage 2000B, N, D and S. There are also provisions for a jettisonable 1,300-litre centerline fuselage fuel tank and for a 1,700-litre drop tank under each wing. The Mirage 2000 can carry up to 6.3 tons (13,900 lb) (or 7 tons for -9 version) of stores on nine pylons, with two pylons on each wing and five under the fuselage. A fixed removable refuelling probe can be attached in front of the cockpit, offset slightly to the right of center. * Built-in armament consisted of twin DEFA 554 (now GIAT 30-550 F4) 30 mm revolver-type cannons with 125 rounds each. The cannons have selectable fire rates of 1,200 or 1,800 rounds per minute. Ammunitions weight 275 g and have a muzzle velocity of around 800 m/s. Even if this is not an impressive value (due to the 30x113 ammunition standard) this gives the noticeable capability to fire up to 16 kg/second, while the M61 Vulcan reaches only (at maximum theoretical ROF) 6 kg (ammunitions weights around 100 gr). * Matra Super 530 medium-range semi-active radar-guided air-to-air missile on the inboard wing pylons and underbelly one. * MICA missiles are replacing the previous. They are available only on the Mirage 2000-5 and further models. They have multiple advantages over previous missiles such as their weight, only 110 kg compared to 250-270 kg. This allows to carry up to 5 missiles under the belly. The data-link, active radar and auto-pilot make these weapons comparable to the heavier AMRAAM. The range is around 60 km, even more than the Super R.530D. So a Mirage 2000-5 with 4 MICA can engage four targets at the same time up to 60 km range, while a Mirage 2000 RDI can engage only two (not at the same time) within 40 km. * Matra Magic short-range infrared-seeking AAM on the outboard wing pylons. Other missiles are compatible, because Magic itself was meant as 'Sidewinder compatible', so AIM-9J/P/L are often used on exported Mirages, and often other IR missiles are also in the Mirages panoply. * The Mirage 2000C can carry air-to-ground stores such as the Matra 68 mm rocket pods (18 each), iron bombs (both French 250, 400, 1000 kg and Mk 80s series), and cluster bombs like Belouga or foreigner models. Some sub-version, especially those equipped with RDM (mainly used in export models) have the capability to use the Exocet anti-ship missiles. The Avion de Combat Futur (ACF) was developed for the French Air Force in the early 1970s. After the ACF was canceled on 18 December 1975 due to its growing cost and complexity, Dassault offered the Mirage 2000 as an alternative. This was a return to the first generation Mirages, but with several important innovations that tried to solve their shortcomings. Project chiefs were B.C. Vallieres, J.Cabriere, J.C. Veber and B.Revellin-Falcoz. Development of this small aircraft would also give the company a competitor to the General Dynamics F-16 Fighting Falcon, which had defeated the Dassault Mirage F1 in a contest for a new fighter for the air forces of Belgium, Denmark, Netherlands and Norway. Small single-engined fighters were clearly the most appreciated by foreign customers, as experience with the larger, twin-engined Mirage 4000 would show. The prototype made its first flight in March 10, 1978 with test pilot Jean Coreau at the controls. Despite the new technologies applied, basing the new aircraft on the Mirage III allowed the development of a flyable prototype in only 27 months from the program start to the first flight, even if active service status needed another six years. In that summer, at the Farnbourgh airshow, this machine displayed not only excellent handling capabilities, but also a full control at 204 km/h and 26 AoA. This was totally unexpected by a delta-wing fighter, and proof how CCD controls were capable of overcoming the delta wing shortcomings related to poor low-speed control, while retaining the advantages, such as low-drag, low RCS, ideal high speed aerodynamics and simplicity, provided by the absence of horizontal tail surfaces. The Mirage 2000 was one of the stars of that airshow and became the direct adversary for the F-16, which shared the CCD control and relaxed stability. 02 Prototype followed in 18 September 1978 and 03 in 26 September 1979. After 400 hours of flight, they were sent to CEV (Centre Experimental du Vol). 04 Prototype was a demonstrator made by Dassault for its own purposes, and finally the first dual-seat M.2000B flew in 11 October 1980. The first production example flew in November 20, 1982 and the aircraft went into operational service in 1984. They were practically pre-production aircraft, because they had no SARH missiles (RDM-1 radar) and the first model of SNECMA 'Super Atar'. M-53-2. The last Mirage 2000 was delivered on November 23, 2007. The Mirage 2000 is scheduled to be replaced in French service by the Dassault Rafale, which became operational with the French Air Force on June 27, 2006. The Mirage 2000 production line was shut down in November 2007 after the last aircraft had been delivered to the Hellenic Air Force.